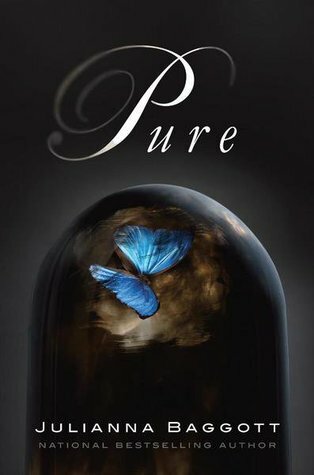 Bookittyblog YA Book Reviews: Pure by Julianna Baggott Review and Giveaway!! I’m going to admit that I was a little intimidated by Pure. Partly because of it’s size (400+ pages). When you read this book you have to give it your all. Let me tell you this, I got lost in it’s dark world and I was scared, excited and a bunch of other feelings at the same time. I loved it. This book makes you think: What if something like this happens? Right after I had that though, I wanted to go dig a hole and hide. This is scary you guys! The writing is beautiful and graphic. When I think of the writing, what first comes to my mind is: Food for your imagination. Does that make any sense? It’s just so descriptive and vivid that you can see every single character in your head. Baggot doesn’t just know how to write and make characters come to life, she also makes the world around them come to life. When I read and I can see in my head what I’m reading like a movie, I know I’ve got an amazing book in my hands. I don’t want to give anything away but I would love to tell you guys a little bit about the characters in Pure. So, everyone out of the Dome got fused to whatever was close to them when the detonations went off. Take Pressia for example, her hand is fused to a doll head. Isn’t that crazy? How did the author come up with that? The mutilations don’t end there. When I said they got fused to whatever was closed to them I meant ANYTHING! There are the groupies who are fused to other people, there are people who are fused to animals and so on and so forth. Anyway, Pure is crazy good. If you like dark and awesome this is the book for you. Here are some awesome drawings by my friend Jocelyn. Both are Pressia and her doll hand. Now with the giveaway. Thanks the publisher I'm giving away a copy of Pure! To enter just fill out the Rafflecopter form below. One winner will be chosen on 3/8/12. Sorry US only. OH MY GOSH. This is amazing. So creepy to see Pressia's hand in a photo like this!